With so many connection standards available to the computer user these days, it goes without saying that sooner or later you’ll run into compatibility problems, trying to let one device talk to another without some sort of middleman involved. Brando has your data transfer interests at heart with the USB + eSATA to SATA adapter that enables one to connect virtually any SATA device to your computer via the USB/eSATA port. Perfect for cloning, data transfer or backup purposes. 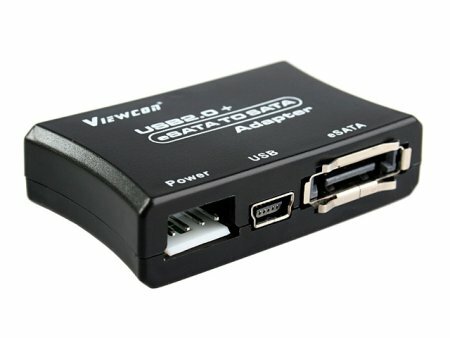 This USB + eSATA to SATA adapter is compatible with all SATA devices, ranging from DVDs to 2.5″ and 3.5″ hard drives. You can place your pre-order for $33 today, and shipping will commence in October. I’ve been buying USB to Sata/eSATA devices (with the AC adapter and cables) straight from China for $13 and that includes the cost of shipping. Devices like this have been available for a long time now. where can i buy it and whats its pricing ? ?